Diamond Shoppers have many critical questions when deciding to make a purchase. An obvious inquiry would be, "How do I know this is a real diamond?" Buyers will also want to know if the stone has been treated in any manner. A basic way to understand the overall quality of the diamond is to know the meaning of its four key attributes. These attributes are color, clarity, cut and carat weight. Professionals in the diamond grading world call these attributes "The Four C's." The Gemological Institute of America was created to present a universal language in the world of evaluating diamonds. The institute was founded in 1931 and is the largest of its kind in the world. The International Diamond Grading System was created by the GIA and is used around the world. Other key elements to grading a diamond include the stone's shape and the information on the diamond's GIA Certificate. Round diamonds are the most popular and are renowned for their fire and brilliance. They have a classic look and carry the image that most people think of when picturing a diamond. The Square stone is known as Princess, or the anti-round. The Princess diamond has a modern and youthful shape. It has grown popular with traditional and contemporary buyers. Asscher diamonds are square. They feature step facets and cropped corners. Asschers are associated with opulence and wealth. They are the most ideal cut for an art-deco setting. The Emerald cut is distinguished by double corners instead of facets. It has an unmatched, old world look. It is often worn with larger side diamonds. Cushion cuts have rounded corners and curved edges to go along with large facets. It is considered the most vintage stone and is paired with Halo settings. Radiant diamonds are an alternative to the Emerald cut. They are presented in square or rectangular form. It is considered a fashion-forward choice. The Marquise diamond has a dramatic shape. It features pointed ends which gives it a delicate appeal. The Oval cut is considered to be a sophisticated shape. It combines the brilliance of a round diamond with a unique structure. It often appears larger than a round diamond of equal carat weight. Pear diamonds are often called teardrop stones. This is due to their dramatic shape. The Pear cut is known to be a more feminine style. Heart diamonds are rare and unique in the form of engagement rings. They are normally paired with rubies and pink sapphires in order to compliment the romantic touch. Evaluating a diamond's weight is a simple process compared to the other measures. However, it is a part of the diamonds overall official report. Stones are weighed in a sealed chamber at the GIA laboratory. One carat equals 200 mg in weight. Each diamond is placed on a GIA measuring scale and weighed to fifth smallest decimal place. The GIA cut scale ranges from excellent to poor. Evaluating the cut of a diamond is more complicated than its obvious shape. Each diamond's unique cut and polish affects the amount of sparkle and brilliance it is able to display. The diamonds are placed in a sophisticated device that rotates the stone 360 degrees continuously. Scientists evaluate various variables including star length, girdle thickness, crown height and total depth to give the diamond a final grade. The less color a diamond has the higher the grade it will receive. The GIA color scale classifies diamonds on a color scale that starts at D, which means colorless, to Z which is a light brown. There is a master set of diamonds that are used by the GIA to compare each diamond on the color scale. There are 11 levels to the clarity scale that range from Flawless to I3. A flawless diamond will have no blemishes at 10 times magnification. A diamond with an I3 grade will have inclusions and blemishes that are obvious to the naked eye. A microscope is used to conduct the evaluation. The clarity test also looks to see if the stone has been treated to improve blemishes, which affects the level of its authenticity. It is important that diamond shoppers understand how to read a GIA Diamond Certificate. The date on the certificate verifies when the diamond was certified in the lab and not when it was cut, mined or sold. Diamonds with a certificate date over 3 years old should be carefully scrutinized. These issues will affect the current value of the stone. 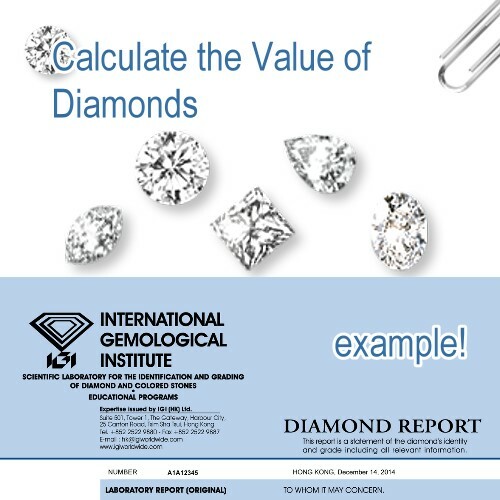 Each diamond has its own unique GIA report number. It is used to verify authenticity. The GIA number is inscribed on the diamond's girdle. A microscope machine displays the number on the screen. A magnifying glass is another way to view the diamond's GIA number. The diamond shape and cut style will also be displayed on the GIA certificate. The measurements show the length, width and depth of each diamond. The GIA report is the most technologically advanced evaluation that any diamond can have. It offers an intricate list of the diamond's unique attributes. It is also a verifiable record of the stones quality. This type of information makes the diamond shopping process exciting and enjoyable. Understanding the "Four C's" will provide a wealth of comfort. Each jeweler should have an up-to-date GIA report on their merchandise. This provides ultimate insurance of the diamond's value.